In our never-ending quest to keep telling stories better through video we’ve learned that there is a lot more than just the script that tells the story. The script comes together with camera angles and movements, lighting design, locations and on-screen talent and post-production to truly tell a complete story. In July, Ryan and Gary attended the Directing Motion Tour taught by Vincent Laforet to learn how to use camera movement to convey your message. (ICYMI—you can read about it here) Last week we were back in school with another very talented man to learn how to better use post-production to tell the story that you want to. 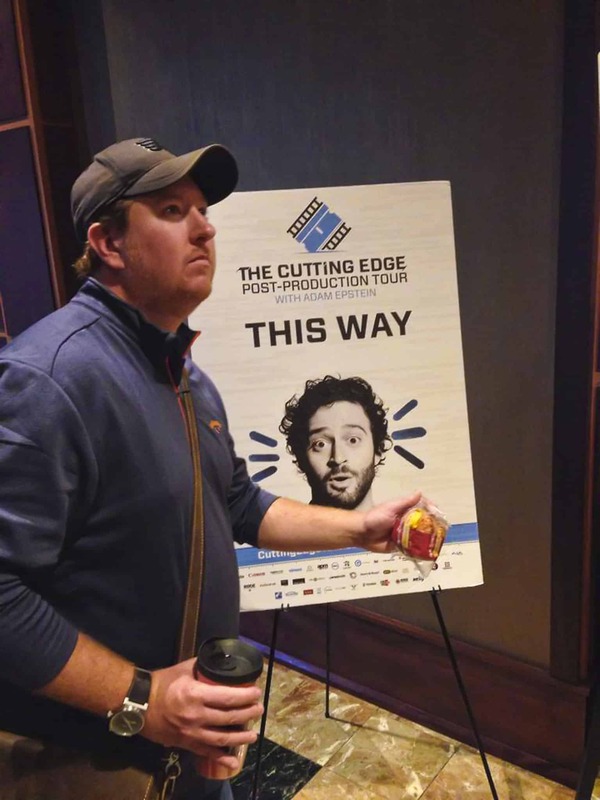 Adam Epstein, the editor for Saturday Night Live’s Film Unit, led a very informative and fast paced 11 hour workshop in Philadelphia on Sept 16th. The morning began with some background info on Adam and how he got to work for SNL. (hint: chase a girl to New York and play kickball) After that was out of the way we got into some philosophy of editing video and keeping a clean workspace. Ryan, being very particular about how his workspace is set-up on the computer, was happy to learn a few new things after Adam shared how he sets things up. The rest of the day was broken into sections including keyboard shortcuts, sound design, motion graphics, compositing, color correction and color grading. After a dinner break we watched and discussed some commercials and movies and how the editing of the clips told part of the story or helped to move the story along. Along the way Adam showed us a lot of the SNL stuff that he has worked on and how they came together. Both Ryan and I came away with a whole new respect for the team that puts these short pieces together. Everything is shot on Friday and Adam is getting cards straight from the camera as they get filled up. As he gets the cards he starts to put the pieces of the puzzle together before they are even done shooting. All the editing, color correction, color grading, motion graphics, special effects and sound design are done Friday and Saturday so the piece can be delivered before the live show starts at 11:30pm EST. Check out this timelapse of Adam doing his thing. SNL – "The Beygency" Edit Timelapse from Adam Epstein on Vimeo.